The young lady in a chat with Satellite Times revealed that weeks after she arrived Oman, she discovered that her new boss, a woman had allegedly killed her last maid in cold blood. 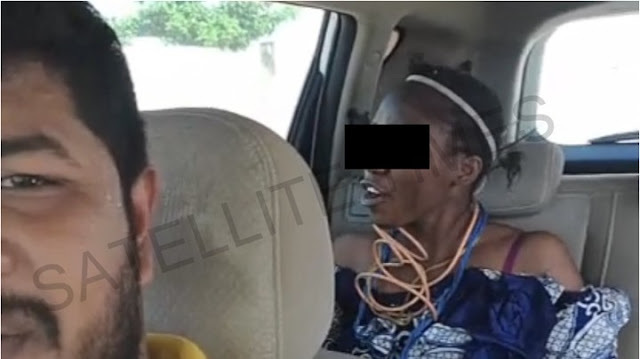 Following the shocking discovery, the lady attempted to flee but could not due to the contract she signed with a recruitment agency in Nigeria and counterpart recruitment agency in Oman which restricted her from even leaving the house. According to Satellite Times, the lady who was frightened in her new 'home', decided to do something in order to escape, hence she decided to fake madness. She started faking madness by uttering gibberish words (including Yoruba incantation) while covering her face with white powder and displaying to the shock of everyone in the house even guests. Embarrassed by the strange manifestation, her new employer called the recruitment agency after two days and queried them for giving her a "mad" girl as a maid. The housemaid continued her "mad" display for three days without food nor water, according to the report. The madam was left with no choice than to buy a plane ticket for the lady and ordered her driver (as seen in the picture) to take her to the airport to ensure she is deported from the country.